Trading binary options can be profitable only when the trading plan incorporates well structured risk management technique. In this regard, most of the strategies used to trade vanilla options can be adapted to binary options trading. One such strategy is strangle, which can reduce the risk and provide higher returns from trades as discussed below. The ultimate goal of strangle strategy is to benefit irrespective of the price trend of a security being traded. There are two kinds of strangles namely the long strangle and short strangle. In the case of long strangle, the process involves buying an out-of-money call and out-of-money put option (in the same asset) with identical expiry time. As long as the price moves sharply in either of the direction, there will be a net profit. This is because the loss is limited (when a call or put is bought) while the profit is unlimited in vanilla options trading. So, the contract which expires in the money will compensate more than the loss resulting from the contract which expires out of money. The strategy should be employed only when a trader expects a drastic change in the implied volatility of an asset. The short strangle strategy involves selling a call and put option, which are respectively out of money. However, most of the binary options platforms do not offer such a facility. Thus, the feasibility of a short strangle strategy is not studied here. However, as we can see below, the long strangle strategy can be applied successfully to certain category of binary options trades. As mentioned earlier, a strangle strategy involves purchasing an out of money call and out of money put contracts. Fortunately, all binary options brokers allow a trader to take two dimensionally opposite positions. 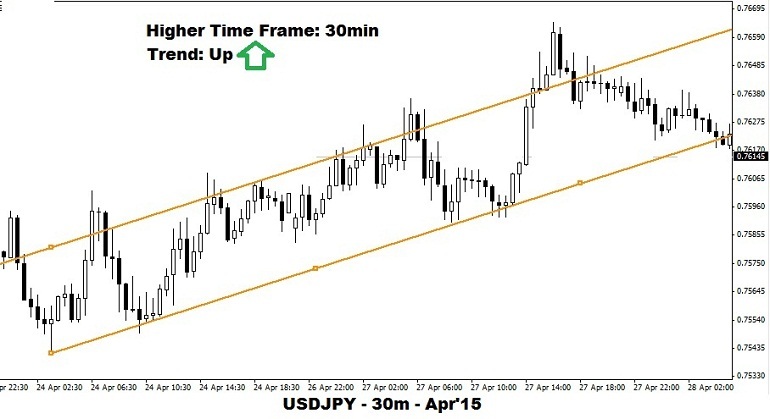 To begin trading a contract, draw a channel connecting at least three support or resistance lines in charts with time frame below, equal and above the contract expiry period. For example, if the contract expires in 30 minutes then use a 15min, 30min and 1hr chart to draw a channel. By looking at the higher time frame chart the trend can be assessed. Similarly by looking at the lower time frame chart the entry price can be determined accurately. It should be remembered that a channel should be drawn by connecting at least three support or resistance price points as shown below. Begin the trade by assessing the trend in the higher time frame. If the price is forming lower highs within the channel then the trend is down and vice versa. If the price is forming lower highs then purchase a put option when the price touches the upper line of the channel. To determine the exact price use the lower time frame. Now, when the price touches the lower line of the channel buy a call option with same expiry time. The return would be little bit less because of the expiry time but may not be too low since the strike or target price is on the higher side. The following are the expiry scenarios for such a strangle trade. Price goes up: The put option would result in loss while the call option would result in a profit. Assuming that expiry in the money will result in a reward of 75%, the net loss would be 12.5% of the total capital invested. If a trader had invested $200 put together in both the contracts, the net amount in hand at the time of expiry would be $175. Price goes down: The net loss would be 12.5% of the total capital invested, as explained above. Price stays in between: Both call and put options will result in profit. The net profit will be 75% over the total capital invested. A trader would have $350 in hand at the time of expiry if $200 had been invested in both the contracts. 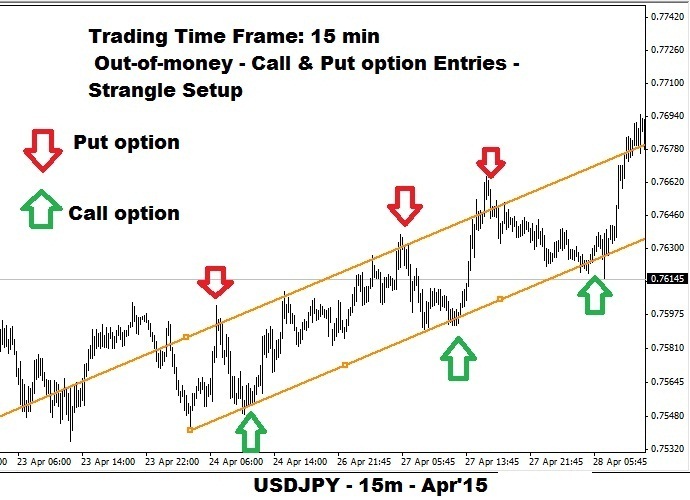 The self-illustrative USD/JPY images below shows how to analyze and create a strangle setup. As it can be understood, the strangle strategy is successful in binary options as long as the implied volatility does not change drastically. This is one of the main contradictions when compared to vanilla options. The reason is that reward in binary options trade is fixed irrespective of the distance traveled by the price in favor of a trader. A strangle setup can be created using a channel, as explained above, in a one touch options trade as well. The only difficulty is that price should touch or pierce the level indicated by the broker. When the asset’s price trades near the lower end of the channel, check for the one touch call option target price provided by the broker’s platform. If the target price is near the upper end of the channel then go for the trade. The same rules apply for the purchase of the out of money put option as well. A range bound market with spikes near the upper/lower channel lines is well-suited for this kind (one touch) of contracts. Price touches the one touch call option target: The one touch put options contract will be worthless. The net loss would around 12.5% of the total sum invested. Price touches the one touch put option target: The end result will be the same as above. Price touches both the targets: The trader will make a profit of more than 75% on the total sum invested. Price stays within the channel: Since neither of the targets is touched, the trader will lose the entire capital invested. Ironically, unlike a high/low trade, the implied volatility should be high with zigzag moves for this kind of setup to be successful. A double one touch option is an investment vehicle structured similar to a strangle setup. The trader wins if either of the two (one above and one below) target prices are achieved. Likewise, a no touch and double no touch option contracts are theoretically far different for a strangle strategy to be implemented. A long strangle is suitable only for experienced professionals who can analyze trend and momentum perfectly. A beginner should use this setup only after a lot of practice in a demo account.